Our current job postings are located below. Select the job category in which you are interested in view all openings in that category and follow the directions within each listing to apply. All positions are full time unless otherwise noted as part time or PRN. Full-time employees may be eligible for paid days off, health insurance and a generous retirement plan. Click here for a summary of benefits. Salary is commensurate with experience. For additional questions, contact us at 770-718-1122. Our administrative employees play a critical role in delivering quality healthcare to our patient population. You don't have to be a health care professional to make a difference at Longstreet. From patient registration, scheduling, business office and other corporate support roles, there's plenty of opportunity here. Longstreet Clinic is seeking an Administrative Supervisor for Urgent Care, Traditional Internal Medicine and Family Practice located in Gainesville, Ga. This position is responsible for facilitating the front office in the day to day operations and supervising staff at a Longstreet Clinic location. This position is Monday-Friday. Management experience is required. Longstreet Clinic in Gainesville, Ga., is seeking an Ancillary Department Manager-Imaging to contribute to the leadership team within the Clinic. This position will direct the operation of imaging department including budget, expense control, reporting to leadership, management of staff, working with direct and indirect providers, and other practice and department leadership. Experience with Microsoft office applications, EMR/Practice Management systems and Radiology information systems required, with Epic experience preferred. Bachelor’s degree preferred, experience in physician office management. with imaging center management preferred. The Front Office Clerk position is for the Radiology department in Gainesville, Ga. This is a full-time position. Longstreet Clinic Radiology is seeking a flexible individual to work a variety of hours to include day, evening and weekends. Good customer service skills are required. Medical office and radiology experience preferred. Spanish and English skills are preferred. Longstreet Clinic is seeking a Front Office Receptionist for its Family Medicine department located in Dahlonega. This position is responsible for front office day-to-day tasks including check in, check out, scheduling appointments, answering the phones, etc. The Accounts Receivable Specialist is a full-time position in Gainesville, Ga. The hours will be Monday through Friday. Medical coding/receivable follow up experience required. Certified Professional Coder (CPC) preferred. Previous GE practice management and billing experience preferred. Spanish and English skills desired. Longstreet Clinic Pediatrics is seeking a full-time medical receptionist to join their busy medical office. This position may require some travel to satellite locations on an as-needed basis. Previous medical office experience is preferred, and excellent customer service skills are required for this position. Employees of this office are required to work one Saturday per month and an occasional holiday. Required: Excellent customer service skills. Longstreet Clinic is seeking a medical receptionist for our Internal Medicine department in Demorest, Ga. Exceptional customer service required. Knowledge of allowables, scheduling appointments and general medical front office procedures preferred. Longstreet Clinic is seeking a medical receptionist for our Orthopedics office in Gainesville, Ga. Exceptional customer service required. Knowledge of allowables, scheduling appointments and general medical front office procedures preferred. This position is full time, Monday-Friday. Longstreet Clinic Obstetrics & Gynecology is seeking a full-time Patient Service Representative. Customer service experience is required. Medical office experience preferred. If you are interested please apply. Longstreet Clinic is recruiting a provider relations specialist. This position is full time Monday-Friday with hours from 8:30 a.m. – 5:00 p.m. Strong customer skills and ability to work collaboratively on a team in support of our Physicians/Providers is required. Previous credentialing experience to include CAQH, NPDB and Microsoft office preferred. Previous medical practice experience desirable. If you would like to be considered please apply today. Longstreet Clinic is seeking a full-time Referral Coordinator to join our Orthopedics team in Gainesville, Ga. This position will schedule diagnostic tests and other procedures as well as assist with surgery scheduling and pre-certification. Longstreet Clinic is seeking a flexible individual to work in registration. This is a full-time position. Good customer service skills are required. Prefer medical office experience. Longstreet Clinic is seeking a flexible individual to work in registration as needed. Good customer service skills are required. Medical office experience preferred. Longstreet Clinic is seeking a surgery scheduler for the Center for Weight Management. This is a full-time position working Monday though Friday in Gainesville, Ga. Medical office experience with surgery scheduling and pre-certification required. 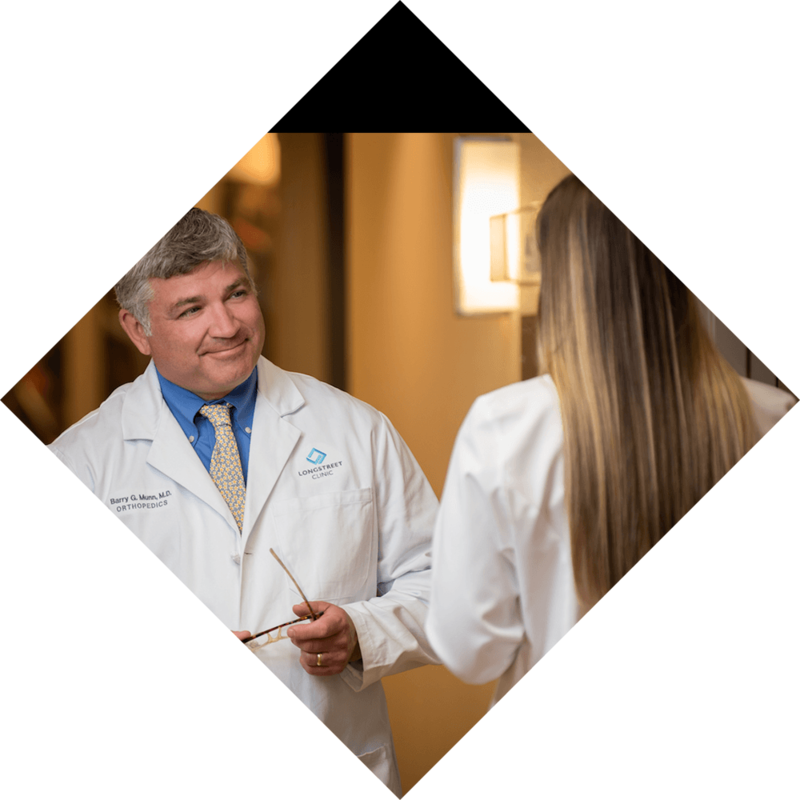 Longstreet Clinic has many of the most skilled, compassionate Advanced Practice Providers who work alongside our medical teams in areas of specialty that span the entire spectrum of quality patient care. Longstreet Clinic Physical Medicine & Rehabilitation is seeking a full-time Acute Care Nurse Practitioner to join our growing practice. This position will work closely with Dr. Marchman seeing patients in our outpatient office as well as in the hospital. Previous Nurse Practitioner experience is preferred. Acute Care Certification is required. Experienced Nurse Practitioner (NP-C)/Physician Assistant (PA-C) needed full-time for Longstreet Clinic’s Center for Weight Management. This position is Monday through Friday. The NP/PA performs physical examinations, health measures and weight loss management guidelines. Knowledge of Family/Internal Medicine and weight loss therapies are a plus. Must be competent in the execution of treatments within one’s of scope of practice. Successful candidates must have a very strong work ethic, friendly personality, a professional demeanor and a positive attitude. Only highly motivated candidates should apply. Longstreet Clinic Neonatology is seeking a full-time Advanced Practice Provider to join our team. Neonatal certification or NICU experience preferred. Communication skills are beneficial as they educate families about neonatal, intensive and postpartum care. If our posted Advanced Practice Provider positions don’t fit your skill set, please follow the link to be considered for other or future opportunities. At Longstreet Clinic, we know that it is the immense talent and dedication of our Allied Health Professionals that make us one of Metro Atlanta’s Top Physician Group Practices by the Atlanta Business Chronicle. Working at Longstreet Clinic means working among some of the most compassionate, collaborative and committed men and women in the health care field. Longstreet Clinic offers employment opportunities for a variety of professionals in support of our Imaging Services deployed across the organization. We offer day, evening and weekend employment opportunities for Radiology, CT, Mammography, MRI, RCIS, RT, RVT and US technologists. Longstreet Clinic is accepting applications for a PRN Medical Laboratory Technician to work in our central lab and in satellite offices. Candidates must be flexible to work day, evening and weekend hours as needed. Longstreet Clinic is accepting applications for a full-time Medical Laboratory Technician to work in our Central Lab and in satellite offices. Candidates must be flexible to work day, evening and weekend hours; Wednesday and Thursday traditional hours, Friday lunch until close as well as Saturday and Sunday. Medical Laboratory Technician license is required. Longstreet Clinic is accepting applications for a full-time phlebotomist to work in our central lab and to travel to satellite offices when needed. Candidates must be flexible to work day, evening and weekend hours as needed. Required: Must be flexible to work day, evening and weekend hours as needed. Management professionals work within Longstreet to develop business strategies, manage budgets, and oversee day-to-day operations (scheduling, billing, collections, etc.). They ensure that the business needs of the practice are met and actively work to recruit new patients. Longstreet Clinic is seeking a Practice Manager to contribute to the leadership team within Longstreet. This position will provide leadership to Orthopedics, Physiatry and Neurology to ensure effective communication, efficient workflow and excellent customer service throughout these specialties. You chose a career in nursing because you wanted to help; to improve lives and to have a real impact. When it comes to choosing the perfect place to share your talents, you deserve to be with others who share your passion and dedication too. This position will primarily support our Oncology Care Model. Strong communication and organizational skills required along with various clinical skill sets including care management strategies for population health is required. The Care Management position will assist patients/families, staff and facilities to achieve high quality, evidence-based, cost-effective, and patient-focused outcomes. Licensed Practical nurse or Certified/Registered Medical Assistant with various skill sets at a minimum is required. Spanish and English skills desirable. The care management position at Longstreet Clinic Cancer Center is located in Gainesville, Ga. The Certified/Registered Medical Assistant or LPN position is for the Family Medicine department in Gainesville, GA. This is a full-time position. Previous medical office experience preferred. All candidates must either be registered, certified or licensed. This position also requires fluent Spanish and English skills. Required: All candidates must either be registered, certified or licensed. Fluent Spanish and English skills. Preferred: Previous medical office experience. Longstreet Clinic Obstetrics & Gynecology has an opening for a Clinical Assistant Triage position in Gainesville. Certified/Registered Medical Assistant or Licensed Practical Nurse is required. Prefer experience with OB/GYN and triage. This is a full time position and may require travel to satellite offices. The Certified/Registered Medical Assistant or LPN position is for the Internal Medicine department in Demorest, Ga. This is a full-time position. Previous medical office experience preferred. All candidates must either be registered, certified or licensed. Longstreet Clinic is seeking a Certified/Registered Medical Assistant or LPN for its Medicine department in Gainesville. This is a full-time position. Previous medical office experience preferred. All candidates must either be registered, certified or licensed. Longstreet Clinic Pediatrics is seeking a full-time CMA/LPN to join our busy office in Oakwood. This position may require some travel to other office locations and will require working one Saturday per month and an occasional holiday. Longstreet Clinic Pediatrics in Gainesville is seeking a CMA/LPN to join our dynamic team of professionals. This position may require some travel to satellite offices on an as-needed basis, and will require working one Saturday per month and an occasional holiday. Longstreet Clinic Pediatrics in Buford is seeking a CMA/LPN to join our dynamic team of professionals. This position may require some travel to satellite offices on an as-needed basis, and will require working one Saturday per month and an occasional holiday. Longstreet Clinic Pediatrics is seeking a CMA/LPN to join our dynamic team of professionals in Braselton. This position may require some travel to satellite offices on an as-needed basis, and will require working one Saturday per month and an occasional holiday. The LPN position is for the Urgent Care department in Gainesville, Ga. This is a full-time position. Previous medical office experience preferred. All candidates must be licensed. We are now offering expanding employment opportunities for Registered Nurses to include Oncology, Pediatrics, Urgent Care, and OB/GYN. We may even be able to offer RNs a flexible schedule that fits your life by offering a variety of work schedules to include day, evening and weekends. As a private, multi-specialty physician group owned and managed by our physicians, Longstreet Clinic is a unique, empowering organization in which to practice medicine. Provide excellent patient care while excelling in your field all while being part of a community of physicians spanning 18 specialties. Longstreet Clinic is seeking a Family Medicine Physician to join our growing outpatient-only family medicine practice with locations in Gainesville, Dahlonega and Oakwood, Ga. Qualified physician candidates must be board-certified or board-eligible in family practice. Longstreet Clinic is a leading-edge, private medical practice located in north Georgia. Longstreet Clinic is recognized for high-quality care, innovation and leadership in the practice of medicine. Comprised of over 200 physicians and advanced practice providers. Longstreet Clinic employee enjoy competitive compensation and benefit packages, which include a rich pension plan, a 401(k) opportunity. Longstreet Clinic is recruiting a board certified/board eligible pediatrician to join our Pediatric Inpatient Service. Longstreet Clinic’s highly trained inpatient pediatricians provide children with comprehensive and compassionate medical care when hospitalization is needed. Terrific benefits include competitive compensation and benefits, shareholder opportunity along with real estate ownership. Sign on bonus/relocation allowance available to assist you with the transition to a new practice opportunity. We provide a solid foundation for physicians to build their practice within an innovative, financially sound, and collaborative organization. Submit your CV to Brooke Bates to be considered for this practice opportunity. Please contact Brooke at (770) 533-6612 with any questions. Several practice opportunities across the Longstreet Clinic 14 county service areas in a variety of practice settings. Opportunities include traditional outpatient only as well as inpatient (hospitalist) positions. Enjoy Life/Work Balance along with the security of private practice in a large multi-specialty group. Outstanding opportunity to join established group of 5 oncologists in private practice in Gainesville, Georgia. Our practice is growing to meet the increase demand for care in Northeast Georgia. Enjoy Life/Work Balance along with the security of private practice in a large multi-specialty group. Longstreet Clinic is seeking a Family Medicine Physician to join our growing Urgent Care clinic in Gainesville, Ga. Longstreet Clinic Urgent Care is primarily staffed by Nurse Practitioners. This position would give the physician a leadership role and development opportunities. This particular role would see patients as well as be involved in day-to-day operations. Qualified physician candidates must be board-certified or board-eligible in family medicine.